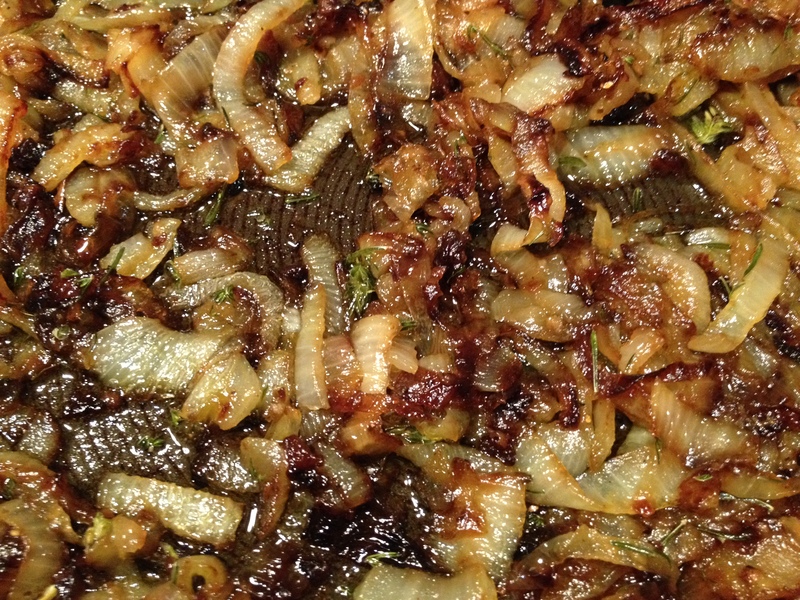 Apologies to anyone French reading this, as this recipe is for an untraditional pissaladière. It uses shortcrust pasty which, I know, sounds odd. Trust me. The best-ever pissaladière we have eaten was at a small restaurant in Earl’s Court, London, this is our attempt to recreate that experience, adapted from a variety of recipes. We serve this as a tapas starter when friends come round for supper, or as part of a lunch buffet on a hot summer’s day. It is excellent eaten the next day, cold. 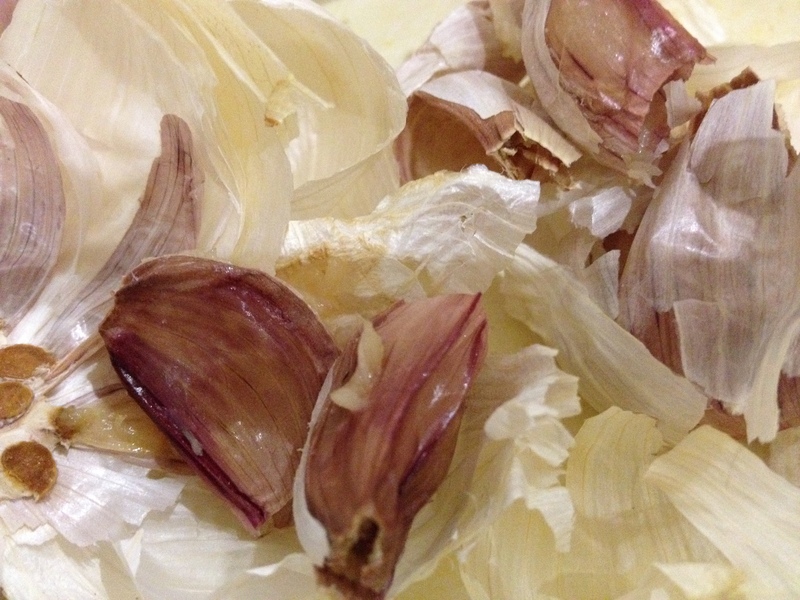 1 80g tin anchovy fillets, drained, halve the fillets lengthwise First roast and mash your garlic. Set aside. 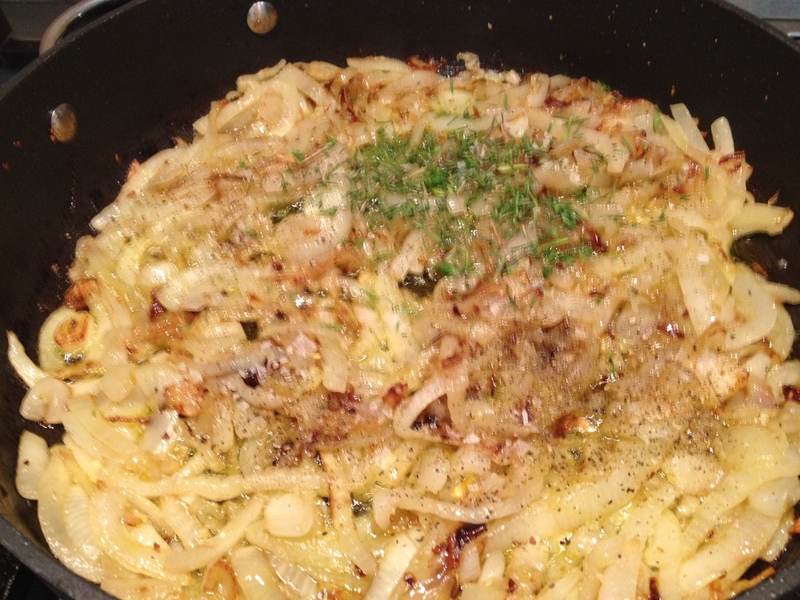 Heat the oil in a pan and fry the onions gently for 20-30 minutes until softened and beginning to caramelize. Add the thyme, salt and pepper. Cover, and cook gently for another 5 minutes, stirring occasionally. Remove the lid and cook gently for another 10 minutes so any liquid reduces. 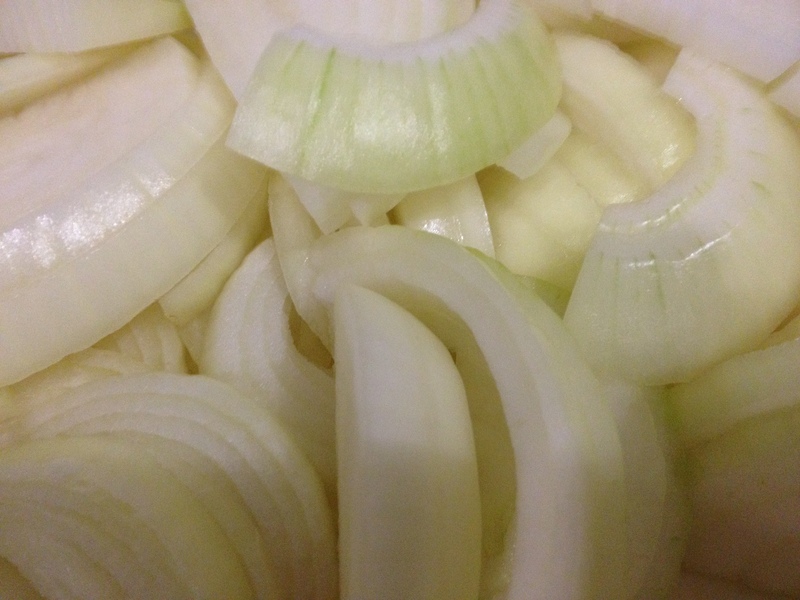 When the onions are meltingly soft, remove from the heat and allow to cool a little. Pre-heat the oven to 200C. Lightly oil a shallow baking tray. Roll out the pastry to a 40x25cm rectangle and place on the baking tray. Using a sharp knife, score a 1cm border around the edge, and then score the edges with a zig-zag pattern. Glaze the border edge with egg yolk. Place the baking tray in the fridge to chill for a moment. Spread the mashed garlic over the pastry base, avoiding the edges, then spread the onion mixture on top. 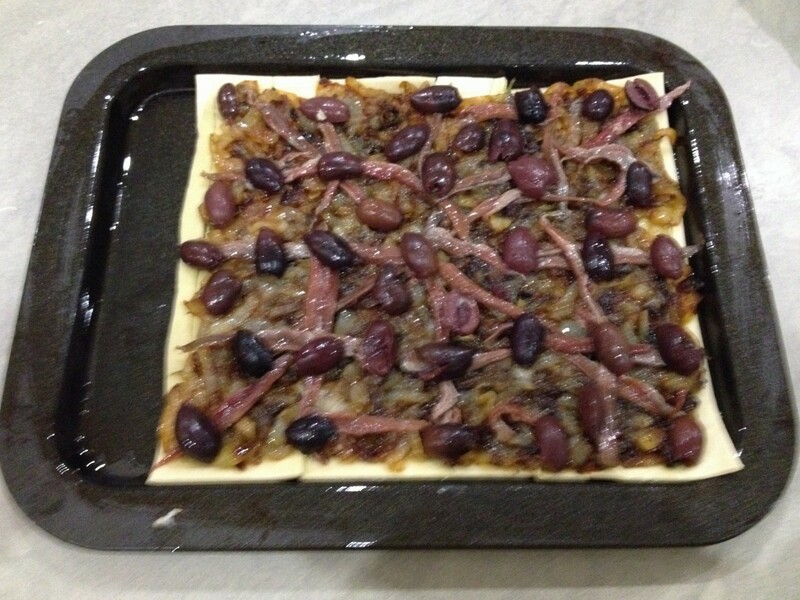 Arrange the anchovies in a criss-cross pattern, putting an olive into each anchovy ‘window’. Bake for 25-30 minutes [read the instructions for your pastry, and check earlier if required]. Serve warm, cold or reheated, cut into squares. Eat with your fingers. This entry was posted in A love of food and tagged Andalucia, food, living abroad, recipes, Sandra Danby, Spain, travel on May 20, 2015 by sandradan1. 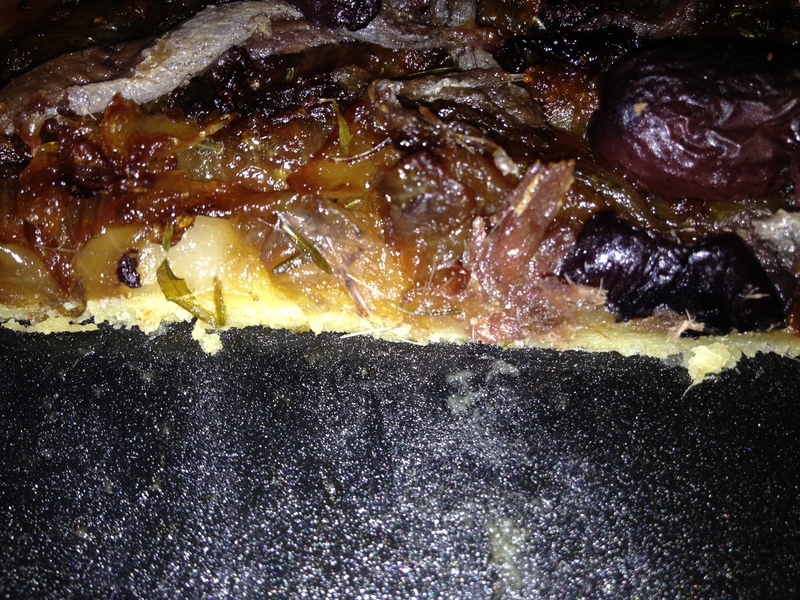 OMG – caramelized onions, garlic, anchovies, and olives – heaven to me, my husband wouldn’t go near it. May I drop by your house for a taste?